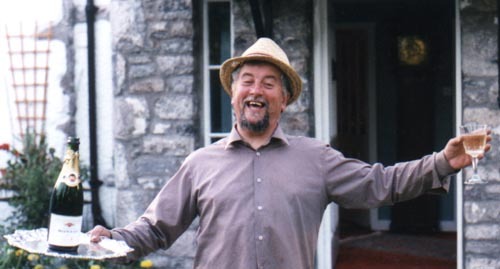 Above: Roger K. Bingham photographed outside his house The Smithy, Ackenthwaite while celebrating one of his books 'From Fell and Field' being a runner up in The Lakeland Book of the Year 2000. Roger Bingham is a professional historian and one of Lakeland's most prolific authors as well as being an experienced broadcaster. He also works with other authors including Bill Bryson with whom he cooperated on 'Notes from a small Island'. He was born - the son of a Doctor - in the ecclesiastical Parish of Heversham and the civil Parish of Milnthorpe and so claims that both Parishes 'disown him' ! He attended Heversham C. of E. School and Heversham Grammar School and was subsequently educated at the Universities of Cambridge, Nottingham and Manchester. He is active in the Public Life of the North West and is concurrently a Cumbria County Councillor, South Lakeland District Councillor and a Milnthorpe Parish Councillor. He has been a life long worshipper at Heversham Parish Church and is its longest serving licensed Lay Minister. 'Memories of Milnthorpe for the Millennium' 2000. © COPYRIGHT IS RESERVED TO ROGER BINGHAM.